Remember the traditional family doctor – the one who knew the entire family and was there for you day or night? The doctor who celebrated new babies, watched kids grow up, and told you straight up what you needed to do so you didn’t get sick? 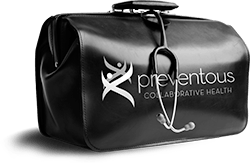 Preventous is a passionate health-care team devoted to helping you and your family celebrate your life’s precious moments in peak health. We focus on illness prevention through scientifically proven medical and lifestyle strategies delivered in the warm, patient, compassionate manner of the traditional family doctor. You work hard to create a life you can be proud of. Let Preventous help you stay healthy so you can enjoy it. Our goal is to help ensure you that you’re part of all the things that count for years to come; that you can be at your daughter’s wedding, celebrate anniversaries, look great at the reunion and enjoy memorable vacations.